Welcome to the beginning of my first ever start-to-finish room makeover! 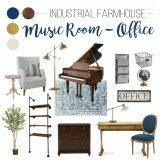 I’ve followed along with the One Room Challenge for a while now, and resolved several months ago that I wanted to jump in for this round of the ORC – so, here I am with plans for my industrial farmhouse office – music room! Eeek! 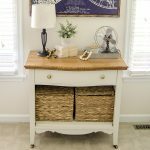 If you’ve never heard of the One Room Challenge before, here’s a brief overview: Linda over at Calling it Home is our fabulous hostess. Along with a team of sponsors, she has invited a handful professional design bloggers to make over a room, start-to-finish, in a 6 week time span. They will post their room makeover updates on Wednesdays. Then, on Thursdays, any blogger that wants to participate in the ORC (that’s me!) will link up weekly progress updates on their own room makeovers. Finally, at the end of the 6 weeks, everyone will publish their final reveals for us all to “oooh” and “ahhh” over! If you are a before-and-after-photo junkie like me, you’ll will absolutely LOVE following along with everyone’s room makeovers. So, that means each Thursday from now until May 11, you’ll see a new post right here on unOriginal Mom as I write all about this room transformation…from my design plan, to paint choices, to DIYs both big and small, to styling and decor, culminating with the final room reveal! The room I’m making over is our formal living room that we’ve been using as a music room/office/catch-all space since we moved into this house three and a half years ago. 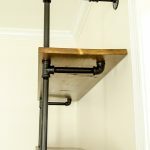 Here are a few “before” photos, and I’ll talk you through our needs/wants for the space before jumping into my design plan. This room is at the front of our house, right off the foyer. There is no door, just a large cased opening, so it’s one of the first things you see when you walk in the house. It may look really light and bright (thanks to a tripod and a long shutter speed)…but those windows open to the front porch and our house faces north, so this room never gets any direct sunlight. That, combined with the dark blue walls, dark wood piano and dark wood bookcase means that this room can feel a little bit like a cave. Consequently, one of my biggest goals with this room is to lighten it up! 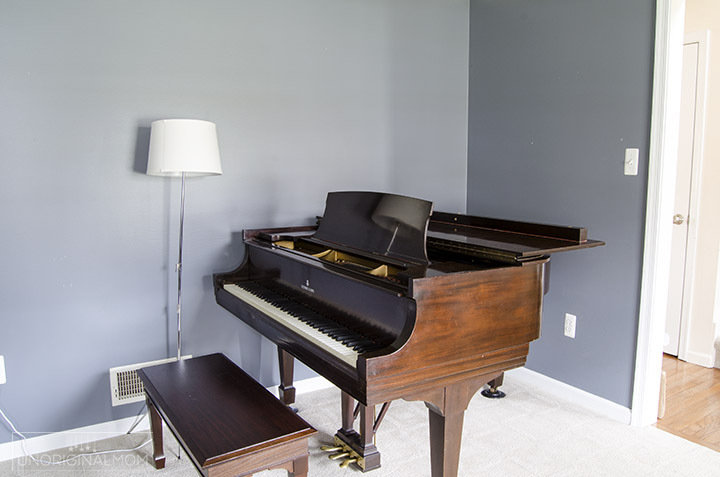 Clearly the best part about this room is the piano. 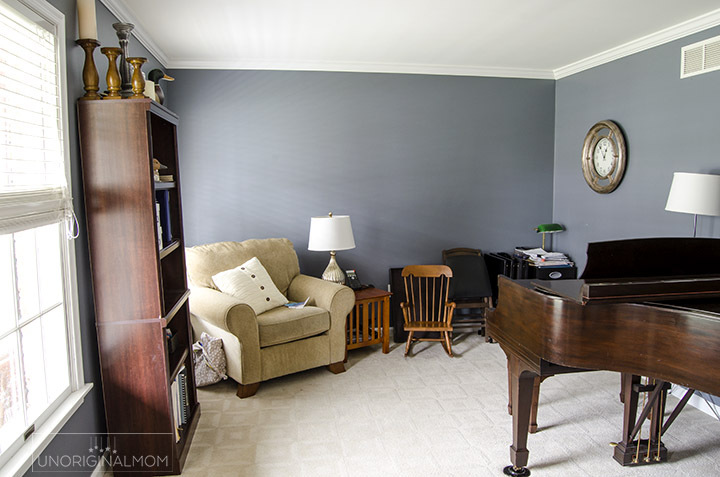 You may not know that my degree is actually in music education (I was a middle school and high school choir director before I became a stay at home mom to my kiddos), so having a dedicated music room in our home is very important to me! 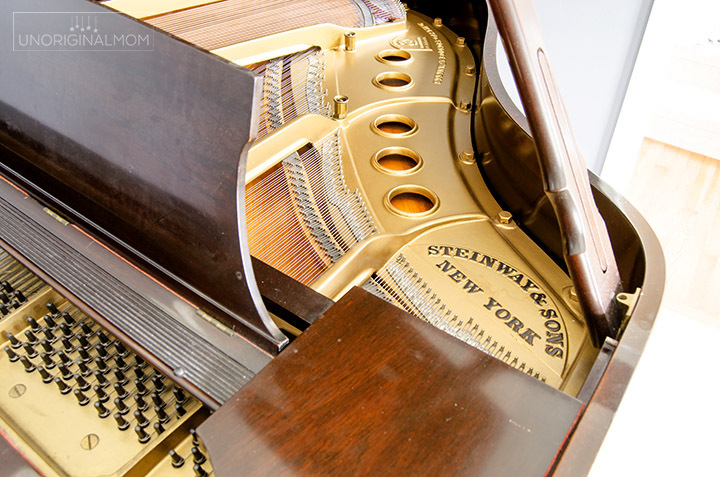 And this isn’t just any piano…this is a 1938 Steinway baby grand that was given to my Great-Aunt Lucille by her father – my Great-Grandfather. When she passed away, her children generously gifted it to me and my family. It’s in really great condition and is an absolutely beautiful piece of furniture, so it will definitely be the centerpiece of this room. Practically speaking, though, we also need this room to function as an office space. Right now we have all of our important paperwork in (or piled on top of) this small cheap-o filing cabinet in the corner. Also, the desk space that we did have set up in our basement has just been transformed into a crafting corner for me (yippee!) but that means my husband doesn’t have any real office space in our home anymore. Granted, he doesn’t need it very often, but he does occasionally work from home so we do need some place where he can do that. 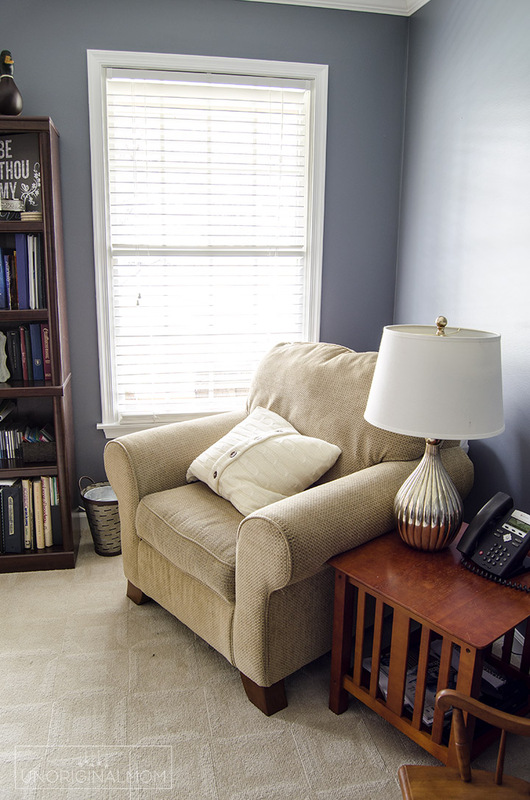 We also have an armchair in this corner by the window where I will often sit to do my Bible study in the afternoon when kids are napping, so I’m planning on keeping a little seating area in this same spot, just with a little bit smaller chair. And clearly, we need to get some wall art in here! Okay, now that you’ve seen all the “before” photos, are you ready to see my design plan? 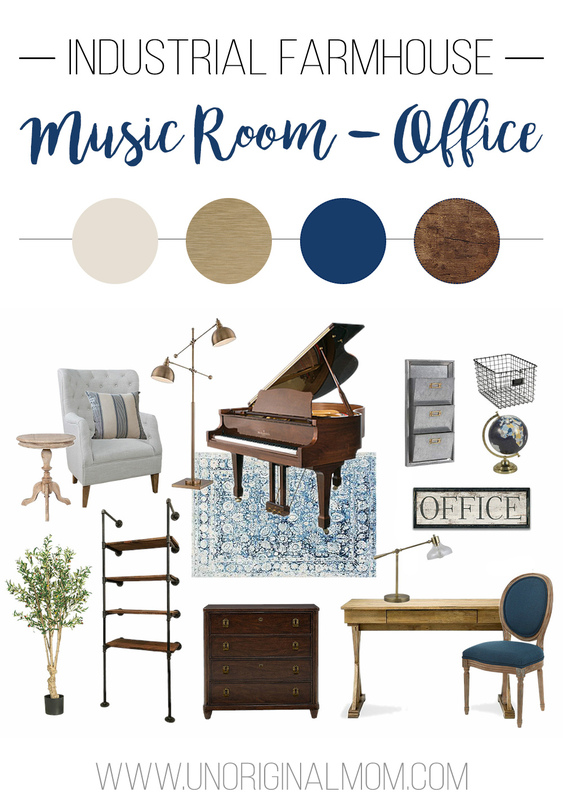 It’s already changed quite a bit and I imagine it will continue to evolve throughout the process, but here’s what I’ve landed on so far for our industrial farmhouse office and music room! 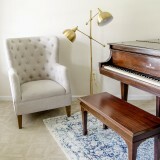 I fell in love with this rug from Rugs USA, and I pretty much planned the rest of the room around it. I’d love to get a big rug to fill the whole room, but A) that’s outside our budget and B) it’s not super practical as we already have really nice carpet in here and it would just be a tripping hazard for my toddler and get worn out and/or spilled on much faster. So the rug will just be a 4×6 to go under the front part of the piano, but I’m pulling the blues and creams out of the rug to be my color palette for the room. 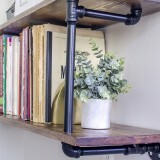 I am also planning on hubby-made DIY pipe shelves, a filing cabinet to go between the windows where the bookshelf is now, a farmhouse style desk, and a new lamp and arm chair to go next to the window. My style is kind of “refined” farmhouse…I really like farmhouse style decor but I tend to not care for overly rustic/super distressed types of things. I don’t want this room to feel too formal or too girly, though, so I’d like to mix in some industrial elements as well – the pipe shelves will really help with that. I’ve got quite a lot planned for this little room, and I hope you’ll follow along as I attempt to make my visions into a reality! Now, in the interest of full disclosure (no secrets around here! ), you should know that I’ve actually already started this room makeover. I don’t know if that’s “cheating” or not…but our schedule this month is beyond crazy, plus we have two small children. I knew making over this room in real time through the ORC was not only going to stress me (and my husband) out to the max, it was just not going to happen. So we got a bit of a head start and actually began working on this room a few weeks ago (if you follow me on Instagram, you’ve gotten to see sneak peeks of this room already on my IG stories! ), though it’s definitely not done yet. I’ll still be posting about our room makeover in increments each week as part of the ORC, and ending with the final reveal along with everyone else on May 11. I can’t wait to share it all with you! Looking for more home decor ideas and inspiration? Check out what the other ORC guest participants have planned for their makeovers! So pretty! The room I’m doing is in exactly the same spot in our home! Can’t wait to see! Thanks Christina! It’s such a hard room, isn’t it? It’s easy to just forget about and not use, but such an important space to set the tone for the whole house. Thanks Jennifer! 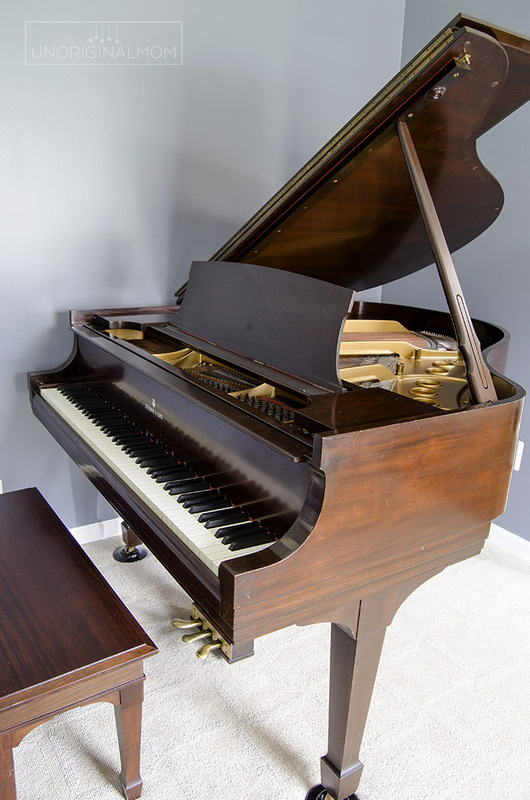 The baby grand definitely presents quite a few challenges (like having to recruit some neighbors to come help us move it before and after painting! ), but is so amazing to have. Your vision board is stunning (and that rug, oh my!)!! Wishing you the best and I am looking forward to seeing your projects for this beautiful room! This is going to be an amazing makeover! I love your choices on the vision board. Good luck! 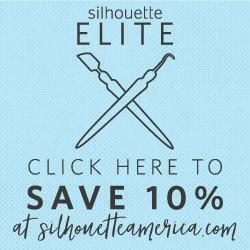 Oh I love this…nice to see something different! I don’t think I’ve ever witnessed a music room makeover. Nice that you’ll be able to make it a multifunctional space, too. Thanks Brittany! 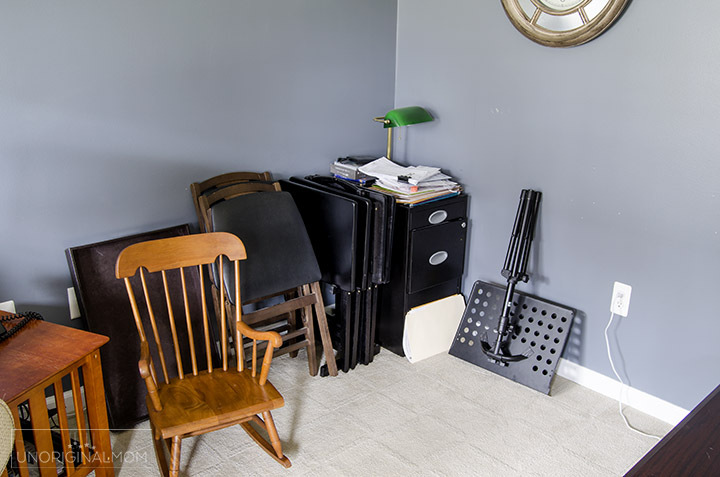 I haven’t been able to find many music room makeovers to browse through either, which has been both a good and bad thing…it forces me to be creative, anyway! Good luck on your first One Room Challenge! You are going to have so much fun! 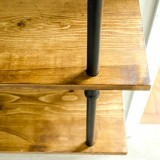 And I can’t wait to see how this multi-functional space turns out! Thanks so much Danielle! It’s already been really fun to prepare for it, so I’m excited for the rest of the process. I love, love the blue and that piano is gorgeous! I can’t wait to see this space come to life. Good luck! Yay! This is my first year too and I am also making over my home office! I love all of your ideas. I can’t wait to follow along and see how your progress goes. I love that rug too! And I’m really looking forward to seeing this space come together. 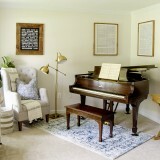 I totally agree about making the piano the centerpiece of the room. Best of luck; I’ll be following along for sure. I love the look you have planned! 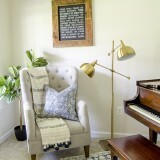 That piano is beautiful, and I love your vision board! Can’t wait to see how it turns out! The plan looks great so I can not wait to see how it turns out. I think that simple touches such as reducing clutter by creating a designated office space, lighting up the walls, and reducing the chair size will make a huge difference! If you are already painting I would paint the ceiling as well. 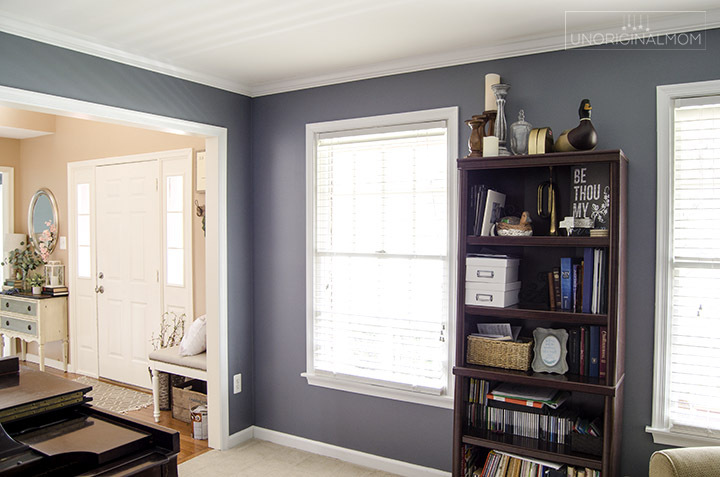 If you paint it a lighter color than the walls it gives the illusion of a larger, airy space. Same goes for mirrors; placing them on the wall adjacent the windows will allow the minimal light you do get to reflect.